The FBI busted up a Cuban spy network that infiltrated U.S. military installations, obtained home addresses of U.S. military officers, and successfully conspired to murder three US citizens and one resident in an act of state terrorism. Ten Cuban agents arrested by the FBI had infiltrated and filed detailed reports on the U.S. Southern Command and the Boca Chica Naval Air Station. Not to mention the case of Ana Belen Montes, the high-ranking Defense Intelligence Agency analyst arrested shortly after 9/11 who pleaded guilty to spying against America for Castro. 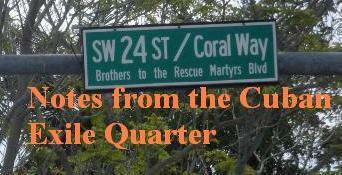 The four murder victims were members of Brothers to the Rescue (BTTR) founded in 1991 to spot rafters in the Florida Straits and save their lives. Amnesty International's Holly Ackerman co-authored a monograph on Cuban rafters indicating that thousands have died trying to flee Castro's Cuba. On July 13, 1994, four Cuban government boats equipped with high-pressure water hoses attacked an old tugboat that was fleeing Cuba with 72 people aboard. The massacre took place seven miles off the Cuban coast. They attacked the runaway tug with their prows while at the same time spraying everyone, including women and children, with pressurized water. The old boat sank, with a toll of 37 dead, including 10 children and a further 18 youths. This was not an isolated event. The regime has a history of committing atrocities against fleeing Cubans. One year later on July 13, 1995 a memorial flotilla for the victims was forced to turn back. At the moment that the hull of the lead boat was partially crushed, BTTR planes flew over Havana dropping bumper stickers that read, "Comrades No. Brothers." July 13, 1995, not February 24, 1996 was when Brothers to the Rescue planes flew into and out of Cuban airspace. Fidel Castro was humiliated and began to plot his revenge using his spies led by Gerardo Hernández to gather information, attempt to discredit and develop a conspiracy that eight months later on the afternoon of February 24, 1996 ended in a premeditated attack with Cuban MiGs blowing to bits two BTTR planes, murdering Armando Alejandre, Jr., Mario de la Peña, Carlos Costa, and Pablo Morales. Castro personally took responsibility for the destruction of the planes. The goal was to destroy all three planes on that mission, and then have Juan Pablo Roque appear as the lone survivor to offer his "testimony." But with one plane's survival and recordings of routine communications with Cuban government air-traffic controllers, as well as the fact that the two destroyed planes' flight paths were outside Cuban national airspace, the conspiracy unraveled and Roque's story changed. I join in this action calling for the freedom of all prisoners of conscience and the return of freedom of association, expression, access to the internet, and the right of Cubans to enter and exit their homeland. In short freedom for Cuba and the people of Cuba from more than a half century of tyranny and 50 years of totalitarian rule. Cuba and the rest of Latin America today have a fundamental difference. The current government came to power in Cuba by force of arms overthrowing the previous dictatorship in 1959 that had ended Cuban democracy in 1952. The rest of Latin America ranging from a healthy liberal democracy in Costa Rica to Venezuela where according to Human Rights Watch Chavez's willful disregard for institutional guarantees and fundamental rights that makes democratic participation possible is undermining democracy and although not yet a closed society I believe that Mr. Chavez would like to achieve that result, but unlike the Castro brothers he has had to face democratic institutions in Venezuela. Venezuela along with all the other governments of Latin America came to power by the ballot box. Which meant as in the case of Weimar Germany that change towards a more authoritarian or totalitarian state would be carried out using democratic processes in the service of ending democracy and erecting a dictatorship. In the case of Germany it is important to remember that the Weimar Constitution of 1919 was never formally repealed but lived on as a dead letter through the entire Nazi Third Reich. In the case of Chavez elected in 1999 he has had to deal with an active civil society in Venezuela and international human rights organizations and NGOs scrutinizing his actions. Nevertheless it is worthwhile to take a look at the Cuban Constitution and some of the specific articles and amendments that nullify its democratic planks and creates a legal base for totalitarian rule because they may be used to achieve the same ends in other Latin American constitutions. The centralization of power in the hands of the executive and the tearing down of the separation of powers: the legislative, the judicial, and the executive is a trend in Latin America in which Cuba is an extreme example. 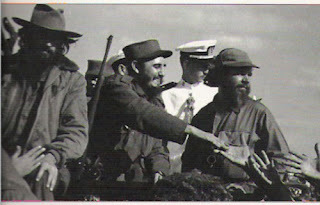 For example in addition to the structural centralization of power already mentioned in the current Cuban constitution the dictator is referred to by name in the preamble along with explicit references to specific military action such as: "the triumphant Revolution of the Moncada and of the Granma of the Sierra and of Girón under the leadership of Fidel Castro." 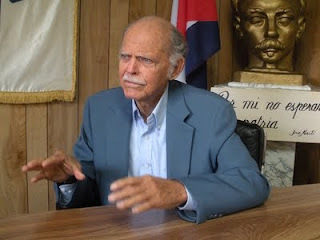 First it is important to place Cuba in its proper historical context beginning with Fulgencio Batista's coup de etat against Cuba's constitutional democracy followed by the struggle against the above mentioned dictator. Recalling that Fidel Castro's call for for restoring the 1940 Constitution along with the previous democracy while claiming not to be a communist and claiming to be a defender of civil and political liberties was an indication of what where popular positions among the citizenry. The portrayal of Batista as right wing is simply false. He had legalized the communist party in the 1930s; helped communists to control labor unions in the 1930s; had prominent communists in his 1940 cabinet and when Batista accused his adversary of being a communist Castro was able to produce correspondence between the Cuban dictator and the communists demonstrating their friendly relationship while the young attorney denied the charge and denounced Batista as a hypocrite. At the same time pointing out Fulgencio Batista’s long association with the Cuban communist party: "What right does Mr. Batista have to speak of Communism? After all, in the elections of 1940 he was the candidate of the Communist Party ... his portrait hung next to Blas Roca's and Lazaro Pena's; and half a dozen ministers and confidants of his are leading members of the CP." The United States placed an arms blockade on Batista in late 1958 and the dictator fled into exile on December 31, 1958. A new regime was ushered in promising democracy and elections but delivered neither. Although there was a Fundamental Law enacted on February 7, 1959 that superseded the 1940 Constitution using dubious means of enactment Fidel Castro through political intimidation; initial early popular support, and the selective use of terror was able to first muzzle the press, shutdown the newspapers, purge all political opponents, hold mass executions that instilled fear in the population which enabled him to rule in practice by decree until 1976 when a Stalinist Constitution was installed in exchange for increased Soviet aide. Following the collapse and dissolution of the Soviet Union the 1976 constitution got an overhaul in 1992. The reference in the preamble to the fraternal friendship and cooperation of the Soviet Union was removed but the totalitarian nature of the regime remain unchanged and in 2002 following the success of the Varela Project which used a plank of the constitution that democrats could exploit to seek reforms led to a constitutional amendment to make the Communist Constitution untouchable. The current system recognizes only one legal political party in Article 5 of the current constitution which is the Communist Party of Cuba and is described as "the organized vanguard of the Cuban nation, is the highest leading force of society and of the state, which organizes and guides the common effort toward the goals of the construction of socialism and the progress toward a communist society." Freedom of speech and of the press is confined in Article 53 of the constitution to "the objectives of socialist society," and "the press, radio, television, cinema, and other mass media are state or social property and can never be private property." In practice this "social property" unlike the public television in democratic countries is at the service of the one party dictatorship and for years Fidel Castro would appear on newscasts providing commentary. It is important to point out that Article 62 of the constitution explicitly states that "None of the freedoms which are recognized for citizens can be exercised contrary to ... the existence and objectives of the socialist state, or contrary to the decision of the Cuban people to build socialism and communism. Violations of this principle can be punished by law." Cuban citizens can either support socialism and communism or suffer the consequences. ARTICLE 88. The proposal of laws is the responsibility of: a) the deputies to the National of People’s Power; b) the Council of State; c) the Council of Ministers; d) the commissions of the National Assembly of People’s Power; e) the Central Organization of Cuban Trade Unions and the national offices of the other social and mass organizations; f) the People’s Supreme Court, in matters related to the administration of justice; g) the Office of the Attorney General of the Republic, in matters within its jurisdiction; h) the citizens. In this case it is an indispensable prerequisite that the proposal be made by at least 10 000 citizens who are eligible to vote. Attempts by Cubans to exercise their fundamental rights within the existing legal system to petition the Cuban government to reform itself based in Article 88 of the constitution have met with repression. For example, the Varela Project with 25,404 Cuban citizens’ signatures presented in 2002-2003 to the government petitioning for political and human rights reforms and [for a new electoral law in accord with international standards] was attacked by the regime both at a systematic and at an individual level. In the Cuban case the dictatorship’s initial response to the request for reform was to announce its own petition drive to amend the constitution and declare it “untouchable” in a referendum equally as undemocratic as the system which the Varela Project seeks to reform. One needed to sign the government’s “petition” or risk losing their jobs or their children’s educational opportunities. On the eve of the US invasion of Iraq in March 2003 the dictatorship organized a nationwide crackdown arrested and condemned 75 Cuban dissidents many of them Project Varela coordinators to up to 28 years in prison, which was the sentence handed down in a show trial to Luis Enrique Ferrer Garcia, a Varela Project coordinator; or 25 years in prison to his brother José Daniel Ferrer García, another local coordinator of the Varela Project and an independent journalist. The writer and poet Reinaldo Arenas observed that “The difference between the communist and capitalist systems is that, although both give you a kick in the cojones, in the communist system you have to applaud, while in the capitalist system you can scream. And I came here to scream.” Some might argue that this is a subtle difference, but I think it an important one. The ability to protest injustice is the first step to being able to remedy it. Freedom of speech and expression to express grievances is an essential feature of a free society. Article 72. A dangerous state is defined as the special predisposition of a person to commit crimes, demonstrated by conduct that is manifestly inconsistent with the norms of socialist ethics. Article 75. A person who, though not in one of the dangerous states specified in Article 73, by virtue of links or dealings with persons potentially dangerous to society, to others, and to the social, economic, and political order of the socialist state may be predisposed to crime shall be warned by the competent police authority as to prevent him or her from engaging in activities that are dangerous to society or criminal in nature. Dangerousness is applied against poor and socially marginal persons as well as political dissidents. A recent victim of this law that drew international attention was a hungry and inebriated Cuban man who said on camera that he was hungry and that there is hunger in Cuba. His name is Juan Carlos Gonzalez Marcos but his friends know him as Pánfilo. He later retracted his statement out of fear, but it was too little too late and was charged with dangerousness and sentenced to two years in prison. Thanks to an international internet campaign he was released, but there are scores like him presently behind bars. 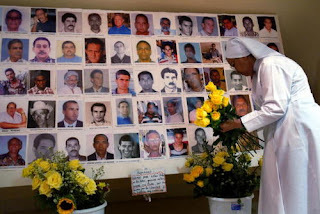 Law 88 "The Gag Law"
Human Rights Watch in their important analysis of Cuba's legal system in 1999: Cuba's Repressive Machinery analyzed the 1996 Law 88 which expanded restrictions on freedom of expression and association and increased prison sentences to 20-years. Many of the independent journalists, Varela project activists, and independent librarians arrested during the March 2003 crackdown were tried and sentenced under this law. All of them were identified by Amnesty International as prisoners of conscience. In 1997 the government organized a "forced" petition drive in which children who did not sign supporting this new law were harassed and in at least one documented case on April 7, 1997 a father who supported his child's refusal to sign the government petition was detained by State Security. Freeing all of Cuba's political prisoners is a good first step, but unless these laws are changed and the constitution amended or set aside so that one without totalitarian elements can be the law of the land the prisons will once again be filled with prisoners of conscience. History has demonstrated that one cannot remain silent in the face of such injustices without catastrophic results. Tens of thousands of Cubans have suffered inside of Castro's prisons for political reasons. For the past half century Cuba's freethinkers have been free to think, and talk without fear of imprisonment only in these brutal prisons. The preceding idea was first outlined by Jorge Valls over twenty years ago in a documentary on Cuba’s political prisons: Nobody Listened. Jorge Valls a poet and writer served 20 years and 40 days of an unjust prison sentence for speaking out in defense of a friend undergoing a Stalinist show trial. Jorge was recognized as a prisoner of conscience by Amnesty International. He has written both a chronicle of his imprisonment 20 years and 40 days and a book of poems Where I am there is not light and it is barred. His description of his years in prison involves the sounds of firing squads in Cuba, brutal beatings, hunger strikes and death as a constant companion. One need not be a political or human rights activist to suffer dire consequences when you express what you think. Earlier this year Juan Carlos González Marcos, known better as “Pánfilo,” appeared on camera saying that he was hungry and that there was hunger in Cuba. Yoani Sanchez, a Cuban blogger, pointed out that he was obviously drunk because otherwise no sane person would ever speak the truth in Cuba unless he was a member of the opposition and willing to go to prison or worse. Sure enough Pánfilo he was arrested; charged with “predilection to social dangerousness” for his outburst. This charge has been used to incarcerate large numbers of Cubans over the decades. Another case is that of Maikel Bencomo Rojas detained on May 7, 2008 brutally beaten by State Security agents and in a summary trial sentenced two years in prison for having a tattoo on his back that says “Abajo Fidel” [Down with Fidel]. 26 years old married with a small daughter he was not part of any organized opposition but merely wanted to express himself. However, out of these prisons there has been a rebirth of spirit and hope amid all the misery and torture. The Cuban Committee for Human Rights and much of the democratic opposition were forged in prison and tempered by its brutality to confront a totalitarian system. A musician like Gorki Aguila of the Cuban punk rock band imprisoned because of lyrics critical of the dictatorship in a sham trial would meet Dr. Oscar Elias Biscet and emerge years later from prison fearless and challenging the dictatorship with scathing lyrics with no room for misinterpretation. In 1969 in a letter to Alexander Dubček Václav Havel enunciated a profound truth: “Even a purely moral act that has no hope of any immediate and visible political effect can gradually and indirectly, over time, gain in political significance.” Following the March 2003 crackdown in Cuba President Havel led a movement of international outrage over the imprisonment of human rights and pro-democracy activists. Along with President Aznar of Spain the European Union was able to denounce the human rights situation in the island and recognize the democratic opposition. Thanks to these efforts some of the 75 have had their sentences commuted to house arrest or forced exile. Moral acts by average citizens have had unforeseen effects such as when the musician Gorki Aguila was rearrested and threatened with four years in prison for “predilection to social dangerousness” an international campaign quickly mobilized involving all sectors of civil society inside and outside of Cuba and the dictatorship released him with a fine and a lesser charge to avoid the avalanche of international attention and public criticism. A similar mobilization around the case of Juan Carlos González Marcos “Pánfilo” led to his release from prison. Real change in Cuba requires that the laws be changed so that fundamental human rights are no longer systematically criminalized. The Varela Project was an initiative by Cubans to do just that and more than 25,000 Cubans signed the petition and the government’s response to this plea for reform: 75 new prisoners of conscience in March of 2003. Eternal vigilance is not only the price for preserving liberty in free societies but also for saving lives and defending pockets of freedom in unfree societies and speaking out for those imprisoned for speaking their minds. Amnesty International Action: On June 18 Stand with Aung San Suu Kyi. She turns 65 on June 19, 2010! 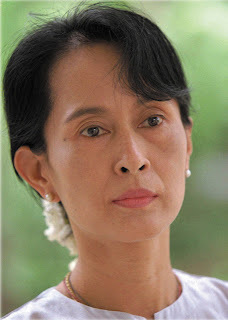 As I post this videos Aung San Suu Kyi is meeting with diplomats as she continues to serve an unjust prison sentence. There has been an effective international campaign for Burma that has probably saved her life and the lives of many of her countrymen who face a genocidal military junta with a horrific human rights record. Below she outlines the importance of "freedom songs" to the Free Burma movement and I think that it can be applied to other freedom movements as well. "I think that musicians and artists anywhere in the world are in a position to draw public attention to our cause in a way in which others cannot. Because one good freedom song can go a lot further than several long speeches - well several interviews like this - or a number of interviews like this is nothing compared to a really catchy freedom song for Burma . If somebody would really come up with it. It could spread all over the world that would help us a great deal." Both Jane Birkin and U2 have crafted songs dedicated to Aung San Suu Kyi and have used her image in their work to highlight her plight and the plight of Burma. This short documentary has a cinema verite quality which interviews the Ladies in White in the midst of their weekly walk to Santa Rita Church in which they call for their loved one's freedom from unjust imprisonment. Clocking in at 10 minutes 54 seconds there is no fluff or padding but direct interviews in real time as the action takes place, and filming the surrounding environment. Although not a political film but rather a human rights film it documents a slice of life and is worthy of a larger audience. 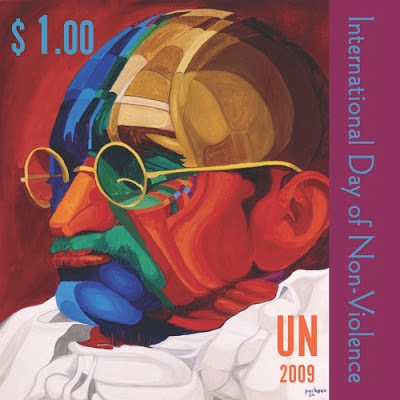 Created in 1948 the Universal Declaration of Human Rights (UDHR) set forth the basic rights of every human being, yet 60 years later in places the world over, violence, poverty and oppression hold sway. To commemorate the 60th Anniversary of the UDHR, and to remind the world that violations of Human Rights are unacceptable anywhere, at any time, Link TV has produced a video, "The Price of Silence" for Amnesty International. 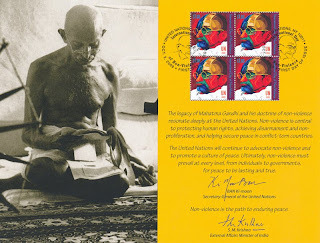 United Nations, Oct 3 (IANS) The United Nations has released a one-dollar colourful postal stamp of Mahatma Gandhi to commemorate the 140th birth anniversary of the apostle of peace observed Friday as the International Day of Non-violence. The stamp, released here Friday by the UN Postal Administration, the world body’s postal agency, has been designed by Miami-based artist Ferdie Pacheco, with the Father of the Nation in red, blue and gold. A long time Miami resident Dr. Pacheco arrived here "as a young doctor, transplanted from his native Ybor City in Tampa , he set up his practice on South West Eighth Street the year the early Cuban exiles began streaming into the city. In their stories, he found echoes of his own family's immigrant roots, as his father was the Cuban-born son of a Spanish consul on the island." Ferdie Pacheco , MD has been called a Renaissance Man because of his prolific career. He has been successful as a pharmacist, medical doctor, Fight Doctor in boxing, including working as a corner man for twelve world champions, including Muhammad Ali for seventeen years. 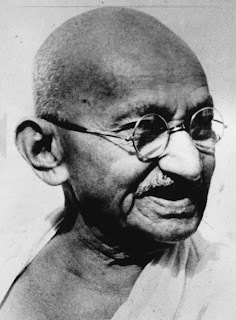 Time Magazine back in 1999 published The Children of Gandhi some of the names featured in the article appear below but there are others who have followed Mohandas Gandhi's path and on the 140th anniversary of his birth it seems appropriate to highlight "Gandhi's children."